The B.C. New Car Dealers Association worries not enough young people are entering the auto industry. A “grey tsunami of retirement” is about to wipe out thousands of jobs in the British Columbia auto industry, warns Blair Qualey, president of the B.C. New Car Dealers Association. The results of a labour market study commissioned by the B.C. Automotive Sector Alliance (BCASA) show the industry needs to hire 20,000 people over the next decade to offset retiring salespeople, administrators, technicians and more, says Qualey. For example, the average age of a repair technician in B.C. is estimated to be 55, the study found. “Some members say they’re facing a loss of half their [technician] staff,” Qualey told Automotive News Canada. “We have a lot of older folks working and in some circumstances some of them can stay on. Qualey is sounding the alarm to anyone who will listen. He pleaded the industry’s case at the annual general meeting of the Union of B.C. Municipalities, where he was a keynote speaker in late September. He told municipal officials gathered in Victoria the looming shortage isn’t just a big city problem, it affects small rural towns, too. Qualey’s association and the BCASA have partnered in an effort to attract young jobseekers to the auto industry. The plan includes a high school outreach program, an extensive employee handbook and a new centralized website that serves as a one-stop resource for auto careers in B.C. 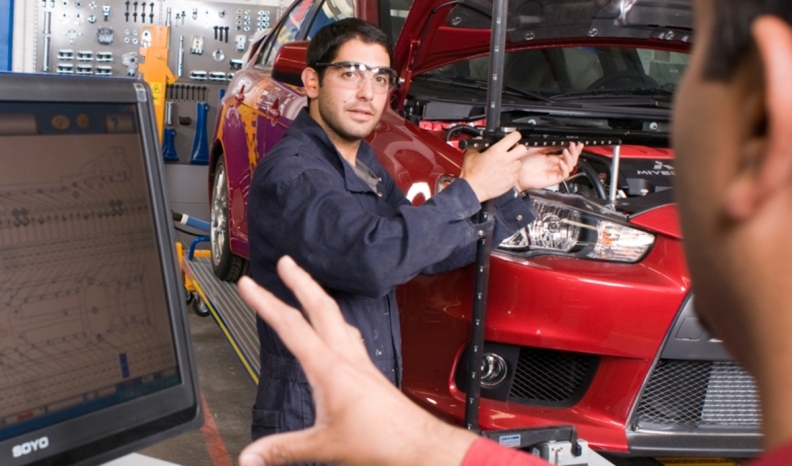 The website, BCautocareers.com, includes auto industry news, career training information, advice and a job board that connects B.C. residents with hundreds of auto jobs across the province. “I think it’s fair to say … high schools and junior high school councillors have funnelled students toward university degrees for many years. So, yes, that’s one of the reasons we got active,” Qualey said. For example, the average wages and salaries of automotive service technician throughout Canada was $42,488, according to the 2011 National Household Survey. The average annual salary for an auto dealer is about $53,000 the Canadian Automobile Dealers Association told the Globe and Mail in 2015. Young potential employees have been enticed by other well-paying jobs. B.C. New Car Dealers Association. The B.C. New Car Dealers Association wants to promote well-paying, 'cool' jobs to young jobseekers. Before oil plummeted to below $50 a barrel and business in the oil sands was booming, young eastern B.C. residents were lured away to Alberta, Qualey said. He is now worried that Ottawa’s approval of the Pacific NorthWest liquified natural gas project in B.C. could have similar effects in his own province. “We really need to start publicizing our own career opportunities,” he said of the B.C. auto industry. In September, a group of dealers and B.C. dealer associations donated nearly $1 million to a new $35-million skilled trades training centre, which includes auto-related courses, on the Kelowna campus of Okanagan College. Qualey will attend the annual general meeting of the Canadian Automobile Dealers Association in Toronto in mid-October and will raise the issue there, too.